Gravity Salon’s Year in Review – Farewell, 2018! With 2018 coming quickly to a close (HOW crazy is that) we wanted to showcase our year in review, and share with you some of the things that made our year so special! 2018 for us has been full of fun, laughter and team-building, and we wouldn’t be where we are without all of our amazing and loyal clients. Obviously every year comes with its hard times and its challenges as well, but with the support of each other we always make it through! The biggest milestone that we reached this year was our 8-year anniversary, and we had a ton of fun celebrating it! In honour of the occasion, we had a celebratory breakfast with mimosas and donuts, and spent the morning learning from our very own Lindie Blackwell about Goldwell’s brand new 2018 colour line – Pure Pigments! The Pure Pigments line has been a huge hit this year both in the salon and in the hair industry in general, and we have had so much fun with it here at Gravity! Our 8-year anniversary really helped us to reflect back on our experiences over the years at Gravity Salon and the milestones that we have reached, and we have never felt more thankful for one another, for our clients, and for the amazing salon that has truly become a place to call home. We have also received a ton of positive feedback from our clients this year about the job that we’ve been doing, which is making us feel as positive as ever! From the cozy and homey atmosphere of the salon, to the complimentary beverages and the way that each stylist makes their clients feel like old friends, we are so glad to hear that our clients, both new and old, are enjoying the experience that Gravity Salon Professionals has to offer. Another major accomplishment that we saw this year at Gravity Salon Professionals is being voted as Barrie’s Favourite Salon for the SECOND year in a row, as well as our salon owner, Ivo Tiberio, being voted as Barrie’s Favourite Colour Technician! This has been such an honour for the salon, as it means so much to us that our clients and our community were the ones who ultimately decided that we would win this amazing award. It feels so good to be able to say that we truly are Barrie’s Best Salon in the eyes of our clients and our community, and that was absolutely a highlight of both 2017 AND 2018. 2018 was also a very special year for us because we had the opportunity to attend our favourite hair competition, Globalzoom right in our very own backyard in Toronto, Ontario! Normally we find ourselves jet-setting to Europe or the United Stated to attend this hair competition, but this year we were lucky enough to experience it just an hour south of our Gravity Salon home! Even better than just attending though, one of our very own stylists, Lindie Blackwell, actually worked the competition for the entire weekend as a Goldwell Stage Artist. We have always known how talented Lindie is, but having the opportunity to watch her do what she does best on a live stage for some of the best stylists in the industry was truly mind-blowing, we are so proud of our stylists here at Gravity! 2018 was also a year of getting involved in the community for Gravity Salon Professionals! We took part in a couple of community initiatives that we never have before, including the Fill a Purse for a Sister Campaign, and Barrie and District Christmas Cheer! We volunteered our salon as a drop-off location for purses and backpacks that were collected by generous members of the community and filled with goods and necessities that local women and children who need them most. All of the purses and backpacks got donated to the David Busby Centre in Barrie, and in turn got distributed to those in need. We were hoping that lots of people would help us out with this initiative, but we never expected just HOW many people would go out of their way to give back to the community! By the end of the three-month campaign we had proudly collected over 70 purses, and we can’t wait to do our part again next year! As well as the Fill a Purse for a Sister campaign, we decided to take part in Barrie and District Christmas Cheer in two ways – by raising money to make a cash donation on behalf of Gravity Salon Professionals, and also by donating our time with almost the entire team going to the Christmas Cheer Warehouse to help pack the bags of toys that would be distributed to children of the recipients on Christmas morning! With the help of many incredible local businesses who donated their goods and services to our charity gift basket that we filled and raffled off to our clients and their family and friends, we were able to present Christmas Cheer with a cheque for $1,050 just in time for Christmas. Raising money and volunteering and seeing just how much this organization does to help the community filled our hearts so much and we are already planning how we can help even more in 2019. We also sponsored our favourite boys’ basketball team for a second year in a row, the South Simcoe Sonics! We love being able to show our support for these boys and helping to make it possible for them to play their favourite game with our full support! We’re lucky that one of the Sonics’ players is our stylists, Stacey Baldwin’s son, so we are constantly getting the low-down on how they’re doing (and we hear they’re doing amazing)! 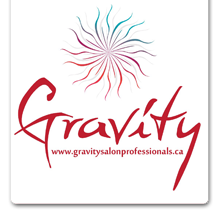 Gravity Salon at Barrie’s Christmas Cheer! As many of you know, we have decided to help fundraise for Barrie and District ChristmasCheer this year by collecting some donations of goods and services from some amazing local businesses from around the Barrie area, and putting them into a gift basket to be raffled off to our clients and their friends and families! The gift basket was an even bigger success than what we could ever have hoped for, and we quickly changed our goal of being able to support two families with$700 to supporting THREE families with $1,050! It costs approximately $350 to ensure that each family who receives support from Christmas Cheer gets a full food hamper with holiday dinner essentials plus more, and a bag full of toys plus one BIG toy for each child of the sponsored families. Though we were ecstatic to have raised so much money for this amazing cause, we decided that we wanted to help out even more by going to volunteer at the Christmas Cheer warehouse so that we could actually see where our efforts went to! We had so much fun being elves all morning and packing up the toys that get distributed just before Christmas! Almost our whole team was able to come and help out and we loved every second of it. Alongside us, there were many other individuals who were there sorting and packing up food donations for the food hampers, even including classes from local high schools! It’s one thing to raise money for a great cause, but to be able to go one step further and help out with the actual behind-the-scenes production made our efforts feel that much more special! With 5 days to go until Christmas Eve, Christmas Cheer is still short of their goal of $250,000 and need everybody’s help in making monetary donations and donating items such as mittens, toys for infants, and toys for 7-9 year-old girls! If you are feeling generous and would like to make a donation, head over to the Christmas Cheer website at https://christmascheerbarrie.comto make a cash donation, and to see a list of all of the local businesses who have drop-off boxes for toy donations! You can also message us to find out how you can help out next year – we will definitely be back there again to do our part! Thank you so much again to everybody who supported us and who helped us surpass our fundraising goal this past month – we couldn’t have done it without you and can’t wait to see what next year has in store! Fill a Purse for a Sister was a HUGE Success! After three amazing months the ‘Fill a Purse for a Sister Campaign’ has come to an end, and the support that we have received from our clients and the community as a whole has been even more incredible than what we could have ever anticipated! For this campaign we offered up the salon as a drop-off location for purses and backpacks full of goods and necessities that those in need may appreciate this winter! The Fill a Purse for a Sister Campaign is an initiative that encourages people to donate new or gently-used purses full of miscellaneous items such as books, make-up, gloves, feminine hygiene products, gum, hand cream and any other items that one may keep in their purse on any given day, and in turn, these bags would be donated to local women in need. This campaign also encourages people to donate new and gently used backpacks full of school supplies and other items that would be handy for youth in their everyday activities! This year, all of the purses and backpacks that are collected in Barrie, Innisfil and other surrounding areas in Simcoe County are being donated to the David Busby Centre in Barrie, a not-for-profit organization in the area that advocates and supports those who are homeless or who are at a risk of homelessness. The David Busy Centre has graciously offered to accept these bags and distribute them to those in the Barrie area who need it most for the winter months. We think that this is such an important initiative, especially with the winter months quickly-approaching and were happy to contribute as much as we could towards this amazing cause! From September 1st to December 1st we have been promoting this campaign on all of our social media and in the salon and the response has been overwhelming! We received an e-mail from our local purse collector yesterday who let us know that we collected a grand total of 73 purses and backpacks this year to distribute, and we are not even the only drop-off location in Barrie so the grand total is likely so much more than that! We can’t thank everybody enough who helped us to go above and beyond the amount of bags that we expected to collect over the past three months, and a huge thank you to Julie, who diligently came and picked up dozens of a bags at a time pretty much every week! It’s such an amazing feeling to know that so many peoples’ lives here in our own community will be made better this holiday season because of the support from our wonderful clients and other members of the community who decided to make contributions on behalf of themselves, their friends and families and even their businesses! We already can’t wait to help take part in this campaign again next year! !